The worst thing that happens to modern football superstars is losing a cosmetics endorsement. Imagine being exiled from your country of birth, your family and friends, and being labelled a traitor, all that and more happened to Ferenc Puskas of Hungary but he preserved his talent, his love of football, and his dignity to become one of the greatest players the game has seen. 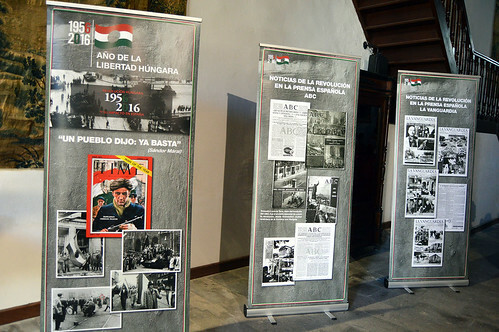 All this was brought into sharp focus for me when I attended a commemorative day to mark the 60th anniversary of Hungary’s short lived uprising against the communist rulers who moved in from Russia after WW2. 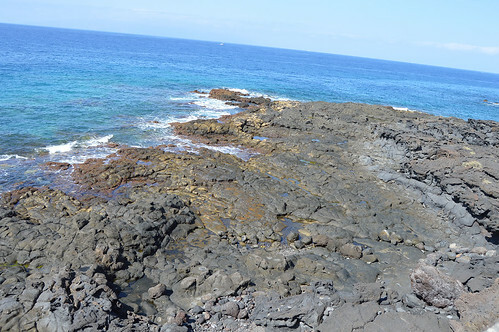 During those turbulent times 193,000 people fled the country, many headed for Spain and there are 300 Hungarians living in Adeje, Tenerife. 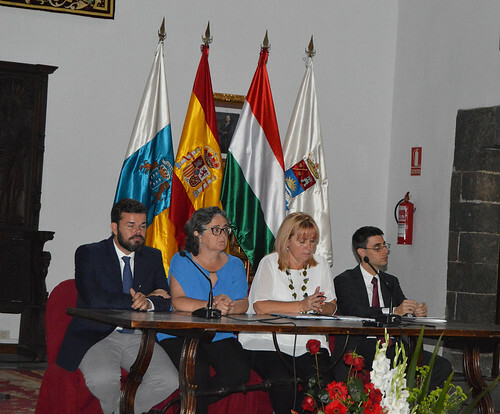 The Hungarian Consul Nora Henriette Hermann-Boer and other leading figures from the community led the gathering in El Convento, between the Plaza de España and the town hall. The red, green, and white Hungarian flag nestled between those of Spain, the Canary Islands, and Adeje as speakers recalled those dark days. 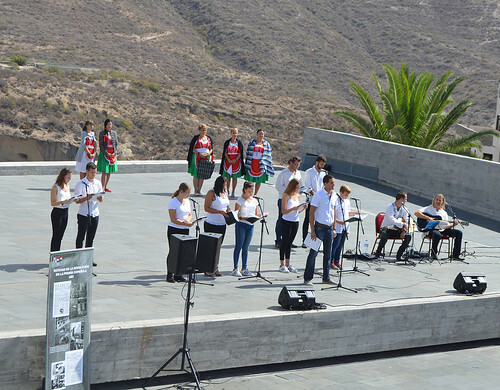 After the service the Spanish and Hungarian national anthems were played to the small gathering. I had been drawn by the promise of a documentary film, The Real Puskas, I had heard lots about the footballing genius and seen old footage but didn’t appreciate the extent and impact of his career not only as a player but also as a manager. Puskas introduced himself to the British public in what became known as The Game Of The Century, England, unbeaten in 24 matches, hosted Hungary in 1953 at Wembley and the sublime Puskas led his team to a 3-6 victory that shook the football world. The Mighty Magyars are still recalled as the most complete team of all time. Get a load of these Puskas stats, he scored 84 goals in 85 internationals and 514 goals in 529 games in Hungary and Spain. The great man joined Real Madird as an overweight, semi retired 31 year old and starred for eight seasons, winning them everything in sight. Later he became a manager, getting Panathanaikos to the European Cup Final and taking Melbourne City to Australian league and cup titles. Puskas career gives a unique insight into the problems in Hungary, a team mate was hung for trying to leave the country, Puskas was abroad with the national team when the revolution was quelled and didn´t return until after the new free republic was formed in 1989. 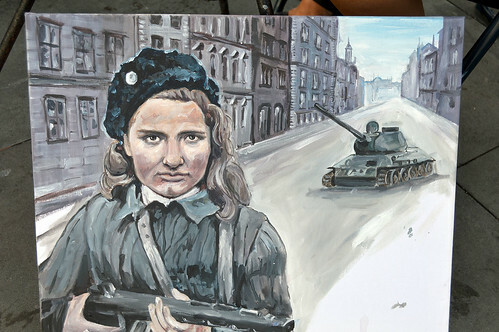 During the uprising 2,500 Hungarians were killed, the communists agreed to negotiate a peace but then sent in tanks to crush resistance. 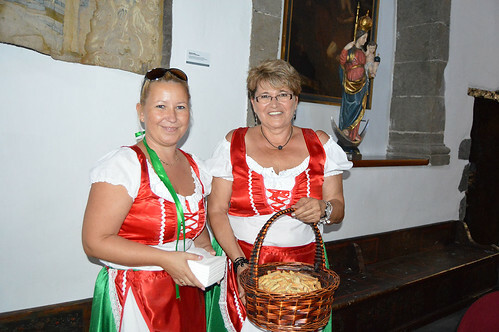 Thankfully these are happier times for Hungary, I felt a little uneasy watching this suffering unfold via the football film as I enjoyed the hospitality of ladies in national costume dishing out cheese straws. After the film there was a recital of music and folk stories on a stage in Plaza de España with the Barranco del Invierno as a terrific backdrop. 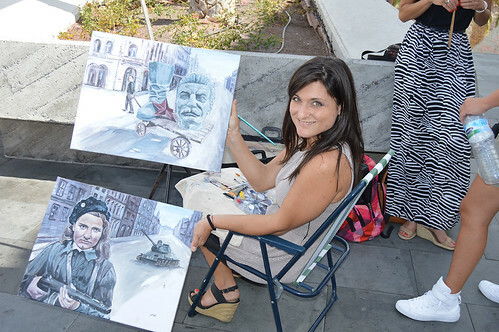 In the plaza there were other echoes of stormier times via the brush strokes of Mariann Szucs, haunting images harked back to the years of struggle. For me though it was a delight to meet some new friends and yet another reason to be thankful for the easy life I have had. Some people go to church on a Sunday, I do my worshipping elsewhere. Two games in a day seemed like heaven but both matches left me feeling my beer glass was half empty. 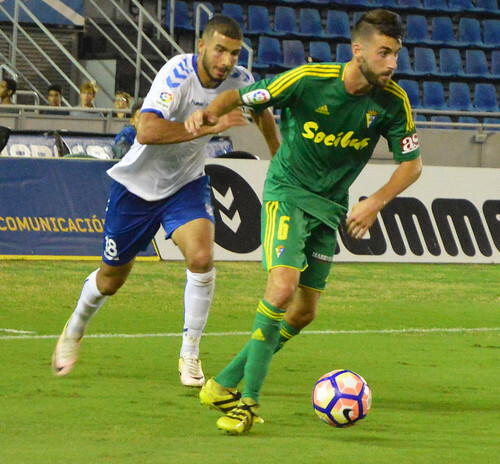 CD Marino let a 2-0 lead slip to tie 2-2 with San Fernando, and CD Tenerife were downright awful in a 1-1 draw with Cadiz that they did their best to lose. 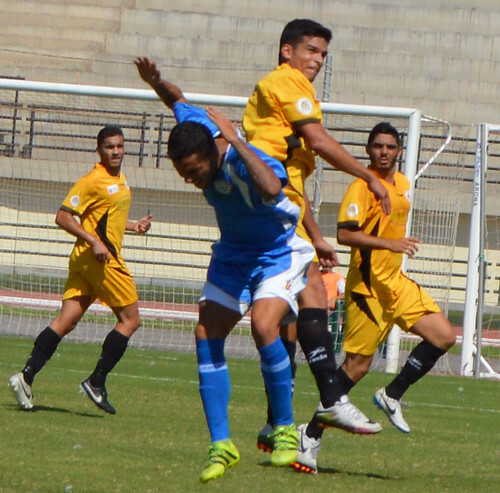 CD Marino have made a good start to the season and are in the leading pack in Group 12 of the Tercera Division. Without either of their big centre forwards, Adan and Ammed it was left to Kevin Castro to take on the central role, he hit an early shot into the visiting goalies hands but battled hard as always. 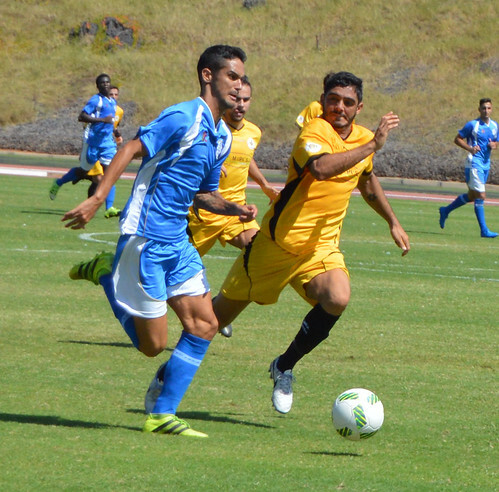 Fran Alonso looked good with a switch to the left and had some meaty tussles with Feito of the Gran Canarian side. 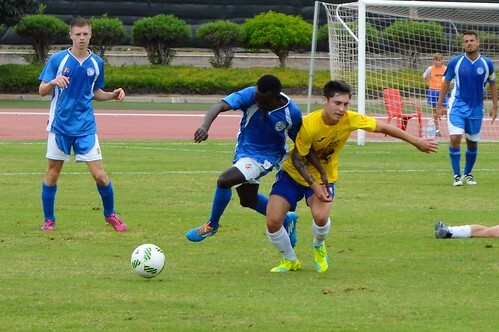 Two former home players, Amado, and Eslava, lined up for the yellows but the nippy Joel was their best forward. 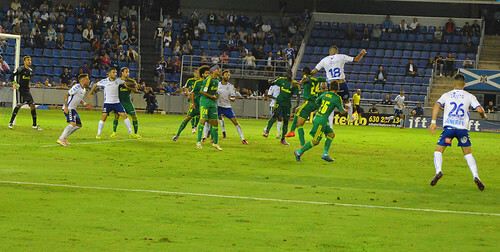 Maikel tried a long shot that went wide and Mendy did similar for Marino near the end of the first half. Marino grabbed the lead with a deft flick of the head by sub Facundo and a clever turn by Alberto gave him a clear sight of goal to make it 2-0. It should have been comfortable from that point but the visiting coach had other ideas. A double change and an attacking frame of mind brought its rewards within minutes. First Feito finished off good creative play from sub Dani, then captain Israel tied the scores, suddenly Marino looked vulnerable. 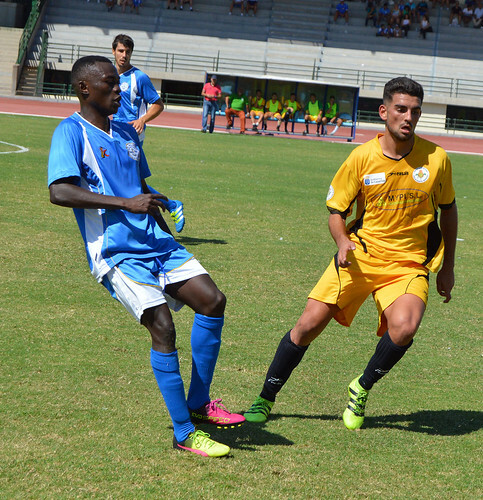 Both sides had chances to win, Marino with a free kick that the keeper punched away, and San Fernando with several raids that Cicovic did well to keep out of his goal. Marino will see it as two points lost but hopefully will learn to not sit back on a good lead. If the first game left me a little disappointed, the second was like someone cutting up my Shoot league ladders, and scribbling all over my programme collection. 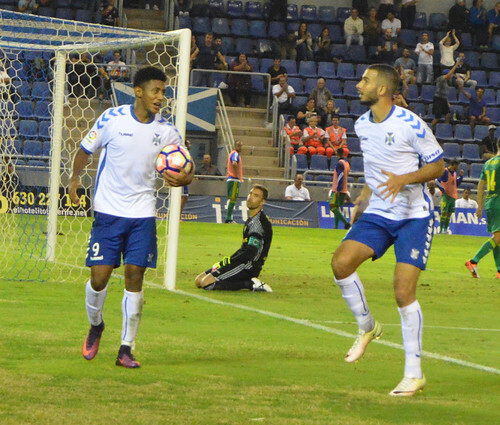 CD Tenerife are struggling again but home to lowly Cadiz should have been a fairly easy home win, instead we lost 1-1, it felt like a loss. 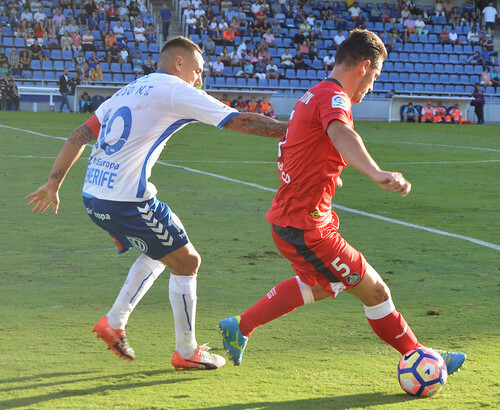 The first half was poor, a midfield lacking ideas and still no start for Cristo Gonzalez. 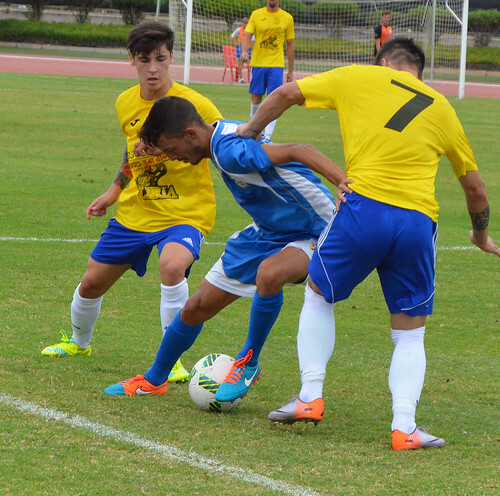 Choco´s shooting boots were back in Honduras and only good defending from Camille and Inaki kept Cadiz at bay. Suso and Amath were quiet on the wings and no one had the confidence or directness to test the visiting defence. Ortuño must have felt sorry for CDT he clattered Inaki and got sent off just before the break. That left a clear plan for the second half, attack the short handed team. It seemed obvious to the 8,425 crowd but the coach, the team, or both didn´t get the idea and were if anything even more cautious in the second half. Jouini took over from Crosas but the service to the attack was still woeful, Suso tried to ignite something but his ball to Amath was lost because of poor control. Omar for Carlos Ruiz could have helped but after impressing up front in the midweek cup game, Omar was deep on the right as little more than a full back. Finally Cristo was brought on after 69 minutes for the predictable Amath, eventually the other players realised it might be a good idea to feed Cristo on the left. Floating in a perfect dipping cross, Cristo found the head of leaping Jouini who showed lethal finishing. If the big Tunisian can make a habit of scoring we might all have to learn his celebration dance. 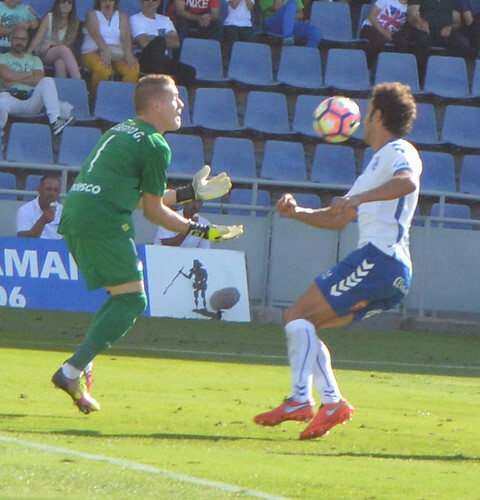 It had been hard going but a 1-0 win would do, but there´s always a but, deep into injury time a bread and butter shot from Santamaria should have been easily dealt with by Dani Hernandez but he fumbled the ball and gave Cadiz a share of the spoils. One of my favourite sculptures has been moved along to greet walkers as they take the concrete path that hugs the coast. 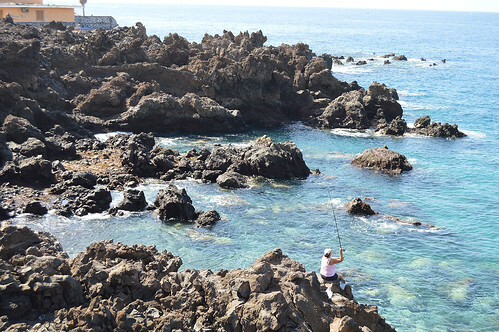 The rock formations left by the receding tide were spectacular, nimble footed fishermen and women had found some precarious perches while others explored brimming rock pools. Up top an enclosed petanque court was staging a hotly contested game and the pink cactus pears were plentiful on the plants. It’s a busy walkway and a fairly gentle one but it pays out so much in sights and sounds. Half way to Alcala there’s an interruption in the form of the new desalination plant, this small section is sealed off but hopefully may reopen soon, the diversion leads inland a few yards to the small village of Fonsalia. There are two modest sized bar restaurants that open after 1.30 pm but all could change if they expand and link the road out to the new ring road. 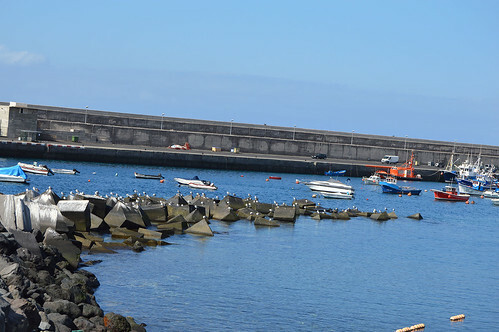 The whole point is to service a new port, it was first planned in 1995 but still only exists on paper, in the meantime I enjoyed my 10 minute diversion through the charming back water of Fonsalia. Emerging back on the coastal path I rose upwards on a narrow and tricky section with a vast expanse of craggy fingers reaching out into the sea. The approach to Alcala is always good, I love the drag of the shingle below in the small coves. A few people had taken the steep stone steps down but I pushed on into the plaza for a cold drink. My old Western Sun office was just off the fishermen’s quay and I have fond memories of lunch break sea swims followed by home made sarnies as I sat on the rocks. 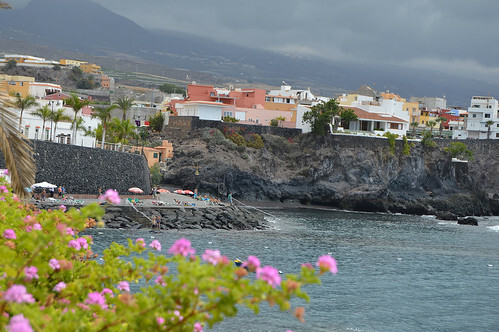 Much has changed and mainly for the good, the walkway around the bay is always a blaze of flowers and opens out to a wide strolling area in front of the Palicio de Isora hotel. The play areas, wooden benches, and Tourist Information Kiosk help to encourage hotel visitors to explore back down into Alcala, and it is reaping the benefit from more trade. 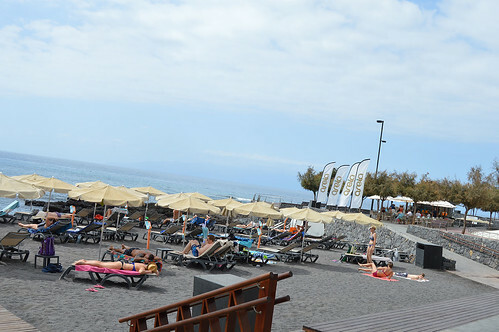 Pressing on the Playa La Jaquita is another good addition, a mix of small, subtle, dark sand coves and rocky bathing pools, all well served by the Arela Beach Bar. The recent upgrade could have distorted the canvas but it has just opened it out and what a pretty picture it makes. 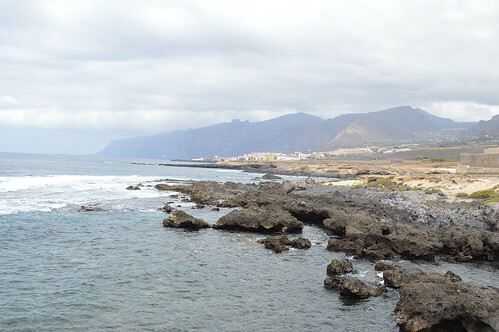 Around the headland and I could see the cliffs of Los Gigantes in the distance but the path was signed as closed for a new coastal walkway to be made. 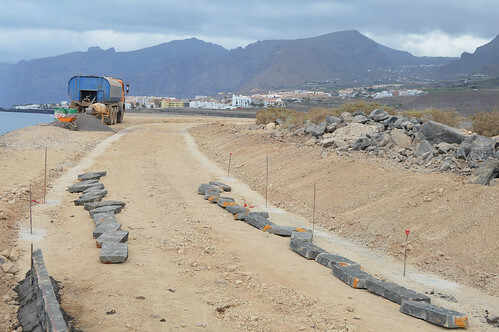 I of course detoured up to the main road and didn’t squeeze around the barrier, If I had, I might have seen the new path taking shape, again it’s that balancing act, this time between encouraging more people to see the wild Punta Blanca coast without smoothing over too many of natures wrinkles. Time will tell but hopefully it will finally stop the illegal campers, I can remember the piles of rubbish they used to leave behind. I still ended up in Varadero ready to revisit old friends on the way through Playa de La Arena. It’s still good up west. At half time in the home game with Villa Santa Brigida the world looked wonderful to CD Marino. Leading 1-0, playing some terrific football, and with a three point lead at the top of the division if the score held. 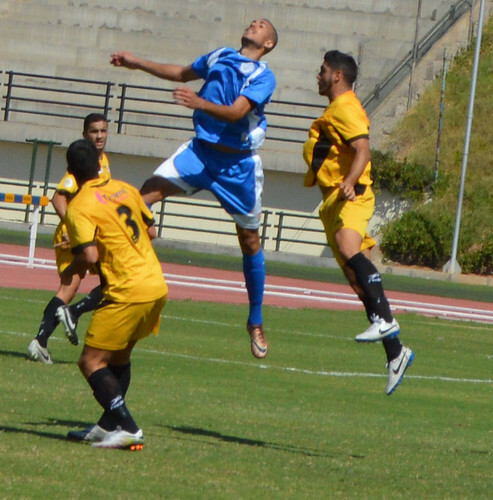 But it didn’t hold and finished 1-1, wind on to the midweek holiday game at El Cotillo and a 3-0 defeat put the blues down into fourth spot. There’s plenty of skill in this Marino side and in their stride they flow and compliment each other but now they will have to regroup and show their character. 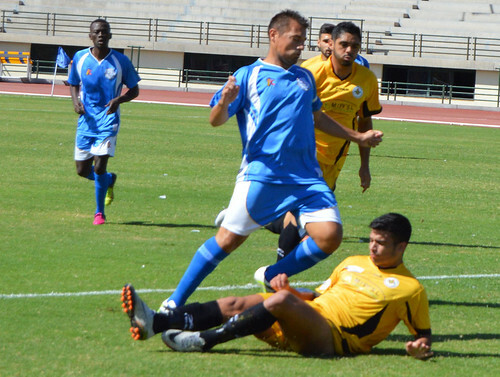 These opponents were two of the best in the division but Santa Brigida, last years champions looked anything but in their slow, careless start on Sunday. 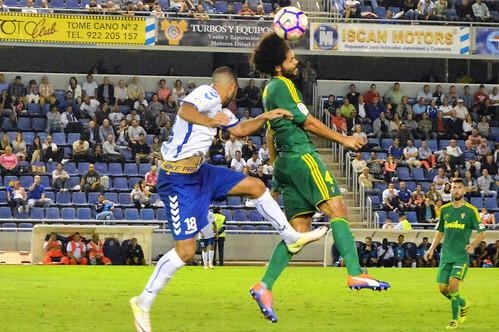 Adan was the spearhead causing problems for the Gran Canaria side but it was Kevin Castro tucked in behind him that inflicted the opening goal after 10 minutes with a calm finish. It was a slap round the face for Santa Brigida who started to put together some good moves, Cicovic was always ready with a sharp save and captain Ubeda and central defensive partner Mendy limited their chances. Facu was one of the stars of Santa Brigida last season and started to show glimpses, his rushed shot just before half time was a warning to Marino. Losing Adan early after the break with an injury took some pressure off the visitors, replacement Ammed drifted away from his central role and when Kevin was subbed it was like a come on for the yellows. The equalizer was a defensive mix up as Santa Brigida opened up Marino’s left side and a cross from wide wasn’t intercepted, Facu was lurking and had an easy tap in. The visitors could have stolen the game late on, both subs missed glorious chances, Juanma was left shaking his head after trying to part the sky with his high shot in front of goal. 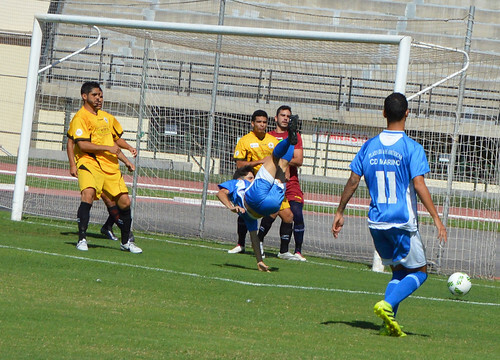 A draw still looked a decent result at the end, especially as close rivals El Cotillo lost heavily away. 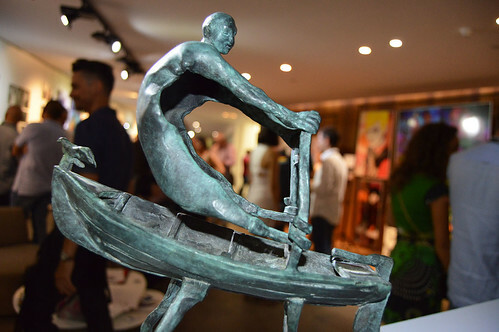 A packed hall was buzzing with appreciative conversation at the opening night launch party of the fifth Ten-Diez exhibition. Some were drawn by the colours, others the styles, and still more by the innovation, but all shared a mutual love of the creative arts. 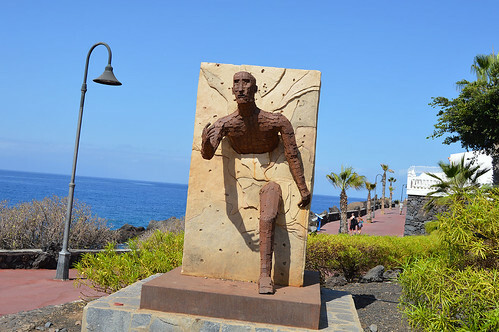 For the fifth year Costa Adeje is the focal point as Ten-Diez continues its mission to make a wide range of affordable art accessible to the south of Tenerife. 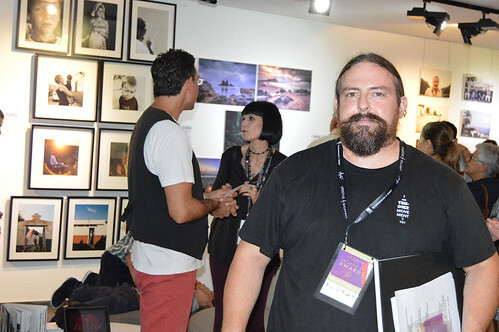 Based once more at the Baobab Suites just above Bahia del Duque the exhibition is under the banner of the Ten-Diez Creative Art Awards. For founder and driving force Mark Fradley, himself an accomplished photographic artist, it was the combination of a selective process that started with 260 entries from as far afield as Tokyo and the eastern block countries. 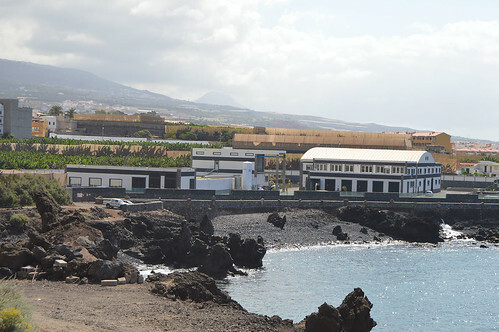 The 34 exhibitors include many based in the Canary Islands with around 13% from beyond and all this year’s works are displayed for the first time with Ten-Diez. As I weaved my way around the hall my vision was constantly distracted by different subjects and ways of expressing them. Sculptures from Francisco Armas Padron offered a multi dimensional centre piece and a thought provoking study. 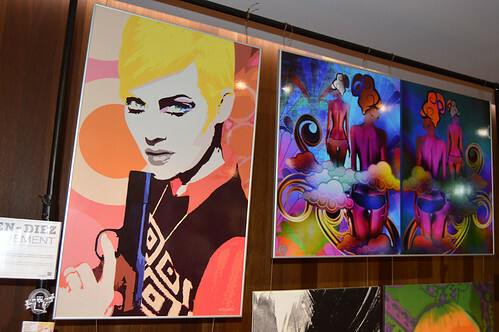 As a child of the 60’s I found the vibrant pop art of Max Mala striking a chord with me and it would wake up any wall. 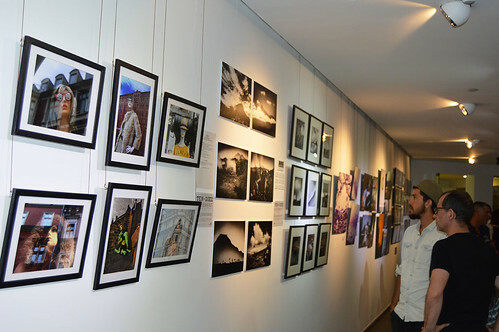 Seigar’s photo studies appealed on several levels, specializing in reflections in urban settings. Javier Gee added a new twist to photos of natures own artwork by adding a human interloper. All of the works are for sale and many of them are easily manageable sizes. A visit to the gallery will open up all sorts of memories, emotions and maybe even inspiration to take up the brush, camera, or chisel yourself. Entry to the hall is free and it’s open daily from 10 am to 11 pm until 26th November. What, no goals again! 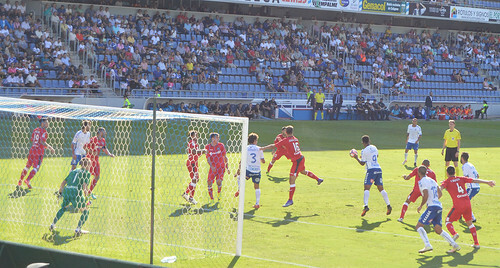 This is getting a bit habit forming, a second home 0-0 from CD Tenerife in two games was cause for concern. 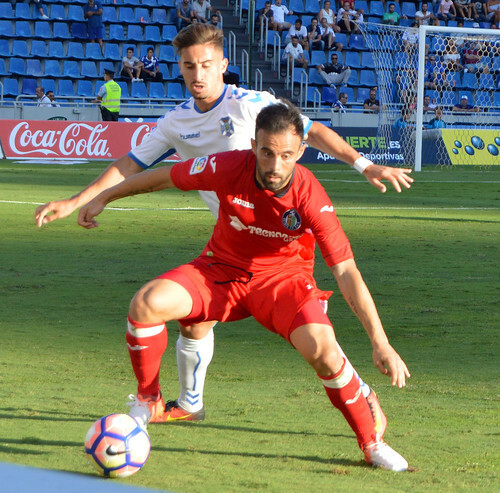 Getafe were just one place off the bottom before the game and there for the taking but one again the team play was predictable, even with changes to the line up. Pep Marti’s favoured pivot system in midfield was dismantled with Marc Crosas left out, in theory it looked like a more attacking formation. Starting Jouini was a popular move but countered by dropping Amath to the bench. To be fair, a training injury to Camille forced a rethink down the left and Inaki was the natural choice to fill the full back slot. 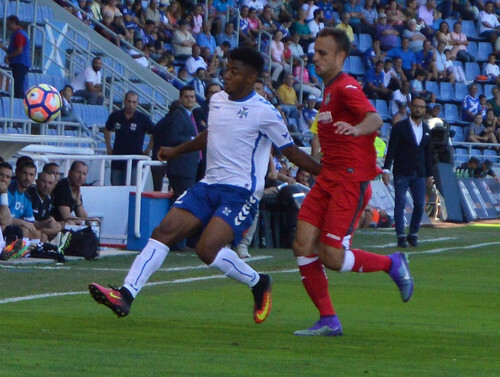 Tenerife were the marginally better side in the first half but Choco looked tired and laboured, at least Jouini showed plenty of fight. There had to be at least another of those “what you doing” moments from the ref, in the first half he ignored a blatant handling outside of his area by the keeper. The worst decision came 10 minutes into the second half, even the most biased of CDT fans didn’t expect a penalty when Jouini went down in the box after trying to force his way through but to give him a second booking and a red was ludicrous. The draw seemed almost inevitable from then on, Amath took over from Aaron but his early promise has faded a little, confidence is probably in short supply at the moment. 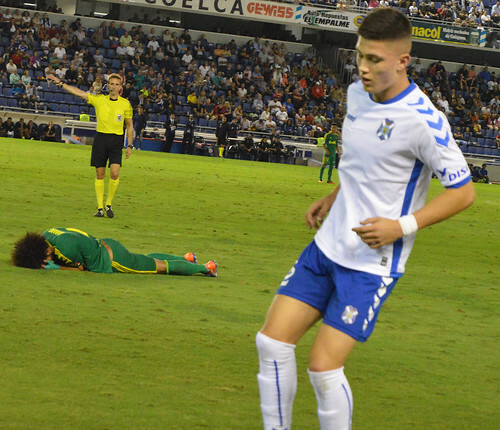 Molina did the decent thing for Getafe, getting sent off in the 79th minute after bowling German over, still there was no home goal. Dani Hernandez even had to make a couple of important saves during the game, points at home just don’t raise the roof. The only laugh of the game was the announcement of the 9,053 crowd, even with fans clinging to the shadows to avoid the baking sun, it was a really creative figure.